My day isn't complete unless it ends with chocolate. A few squares of dark chocolate here, a warm mug of hot chocolate there, a handful of cacao nibs... I can't get enough of it. I have my own chocolate drawer that is well-stocked, always, with my favourite dark chocolate bars. Enough said. Now that we are in the midst of the holiday season, my better self is telling me to stop eating sweets. Despite these good intentions, everywhere you go people are offering you sugary treats that are simply too hard to resist; peppermint, candy canes, white chocolate, milk chocolate and cookies in all shapes and forms. While this is all fun, after a few days of indulgence it's time to get back to eating healthy. This Dark Chocolate Bark has come to my rescue...made with organic cacao powder, coconut butter, coconut oil, sweetened with maple syrup and covered with handfuls of nuts and dried fruit. I just feel better knowing that the ingredients are all good for me and that I will be snacking on the healthy side. Happy holidays and eat lots of chocolate! Any combination of topping will do, here are some ideas to make this chocolate bark your own: chopped almonds, pistachio nuts, pumpkin seeds, sesame seeds, chopped dried fruit, peppermint extract, hemp seeds, cranberries and chia seeds. This recipe is sweetened with maple syrup and is vegan, paleo-friendly and dairy free. Makes enough for 6-8 servings. 1. Line a 9 x 13 pan with parchment paper and set aside. 2. Melt the cacao butter and coconut oil together in a bowl over a pot of hot water. 3. Add the cacao powder, maple syrup, vanilla, cinnamon and salt to the oils and mix until very smooth. 4. 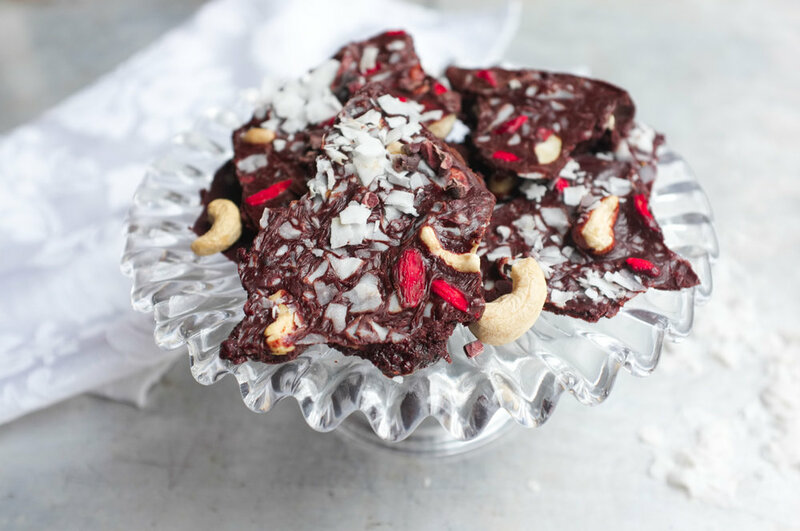 Pour the chocolate mixture into the parchment lined pan and sprinkle with the goji berries, cacao nibs, coconut, currants and cashews. 5. Place in the fridge or freezer for 30 minutes until hard. 6. I like to break it up with my hands into pieces. 7. Store in the fridge or freezer in an airtight container. Because the chocolate bark is made with coconut oil and coconut butter this chocolate melts very easily so it’s better to keep it in the refrigerator or freezer until serving. The 9 x 13 pan makes for a very thin bark, if you like it thicker use a smaller pan.